BOSTON--APRIL 23, 2014--Springboard Retail today announced that In The Pink Stores, Inc. — the largest chain of Lilly Pulitzer® Signature Stores in the US — has launched mPOS as part of a major store transformation project. In The Pink’s eight stores are located in Massachusetts with flagship stores on Newbury Street in Boston and on Nantucket Island. They piloted the project in their Boston store where they removed the cash wrap and stationary POS terminals went 100% mobile. They are using Apple’s iPads and iPad minis powered by Springboard Retail. 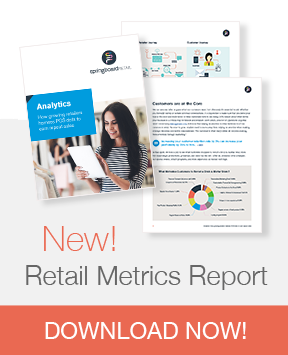 This revolutionary change offers customers a more intimate and convenient shopping experience and puts real time data in the hands of sales associates while allowing them to ring in customers wherever they are in the store. In The Pink District Manager Jess Newman explains, "We have reclaimed formerly unproductive square feet in the store. Space that once was occupied by servers, wires, printers and other ugly hardware has been turned into beautiful merchandisable space-- and it is boosting store sales." The results from the first 11 days of In The Pink's rollout of mPOS reveal a 24.5% increase in sales over the same period in this store a year ago. Transaction count was up 6.5%, transaction value was up 17%, units per transaction was up 12% and total units sold was up 19%. In The Pink repurposed 48 square feet of floor space and reclaimed full floor to ceiling use of 6.5 feet of prime wall space. The Nantucket store is next to undergo the transformation. To learn more about Springboard Retail sign up for a webinar or request a free demo.